Although I live near Wolverhampton, I spend a lot of time in Wales. It’s more often than not the world of football that takes me there and while that may be work-related, nevertheless I try and feed the groundhopping bug as much as possible while I’m there. This time round, while travelling across the country from coast to border, well just beyond it actually, as my final destination was Park Hall, the home of The New Saints FC, I stopped off to take in a game on the way. As an encouragement to football clubs at whatever level to use social media, it was via Twitter that I came across this game and chose it as my groundhopping game for the day. Social media in general has a very dark side but if you’re like me you stay well away from that and use it for positive purposes only. Back to the fixture, which was my 44th Welsh ground, it was a nice afternoon for a game of football. We may be in the final third of October but I needed my sunglasses to watch the match. The competition was the JT Hughes Montgomeryshire Amateur Football League, to give it its full title, and as this was division two that means it is the sixth level of football in Wales. Outside of the JD Welsh Premier League, which is national, all other tiers are regionalised. The game ended 1-0 to the visitors, with the goal coming as we approached the one-third stage. A good run down the right resulted in a well-hit ball giving the keeper no chance at all. Welshpool had the better of the chances and deserved the victory, which sees them three points off leaders Trefonen, in third place. Abermule, on the other hand, find themselves in eight spot in a fourteen team league. 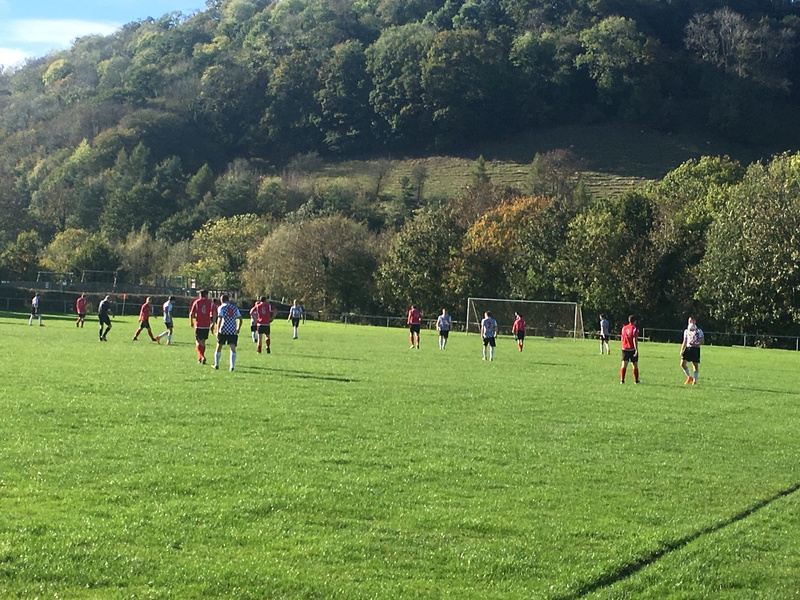 With the River Severn at the one end of the ground and an impressive hill the other side of the A483, it was another picturesque setting for a game of football.